As a mom of 4, I'm always looking for ways to save time and money! Feeding a family of 6 can be expensive and very time consuming! I go to the grocery store AT LEAST 3 days a week, and that includes the big weekly shopping trip. 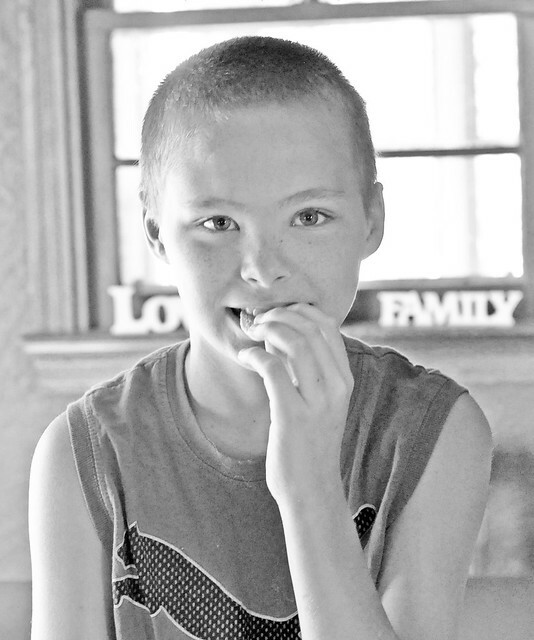 The amount of food my kids consume in the summer is astounding! Let's talk time. Time? What's that?!? Most days it seems like I finish cleaning up from one meal and have to start all over again. I always joke that I'm constantly feeding little humans! And just when I think I'm done for the day and can relax, someone needs a snack! That's life in a big family, and although it can be stressful, I wouldn't trade it for anything! However, I do have one little trick up my sleeve that saves time AND money! Right after Lily was born, Dylan started first grade and Lexie started Pre-K. Our mornings became rushed chaos, and I found myself shoving bowls of cereal and store-bought frozen waffles at them. 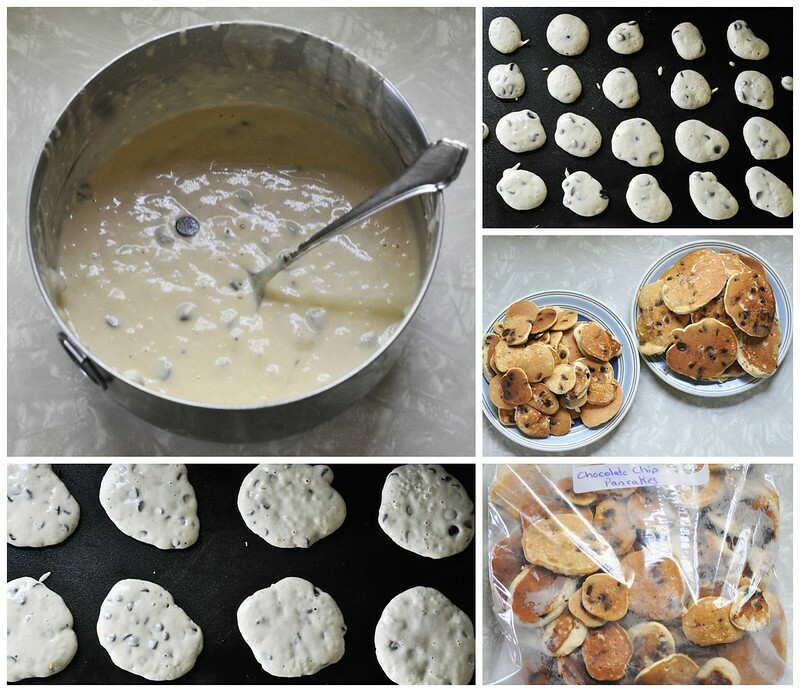 One day, while I was making Sunday brunch, it hit me that I should make EXTRA pancakes, and freeze them for the week! 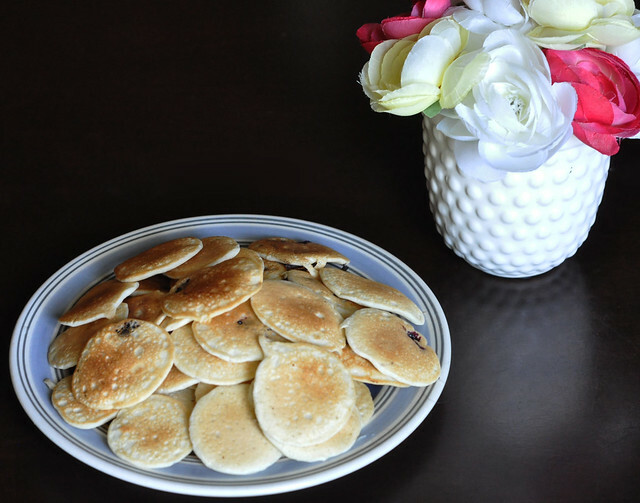 Everyone in our family loved pancakes, and they could be reheated very quickly and even eaten on the go! 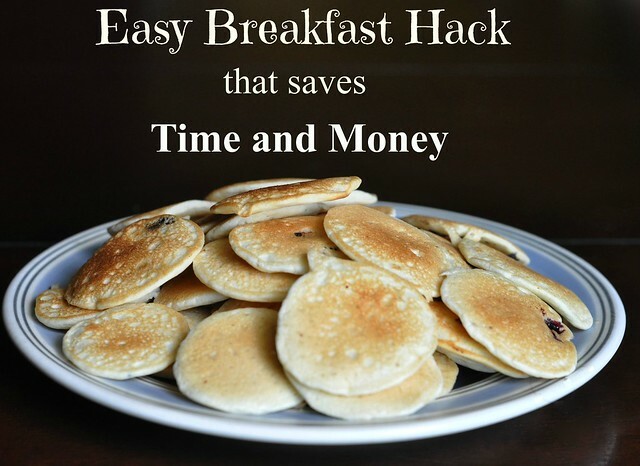 I immediately started that method and it turned out to be the best breakfast hack! Making freezer pancakes has been a part of my weekly routine for almost 4 years. Now, I'll share my "secret" with you! My "secret" ingredient is baby food. Lexie refuses to eat most fruit, so I started sneaking in Lily's homemade purees for extra nutrition. It blended in well and gave the pancakes a bit more flavor. Lexie had NO idea so I just kept doing it! Decide how many pancakes you want to make, then prepare the mix according to the directions. Mix in a large container of banana or apple baby food. Add your chopped fruit or other ingredients and stir. 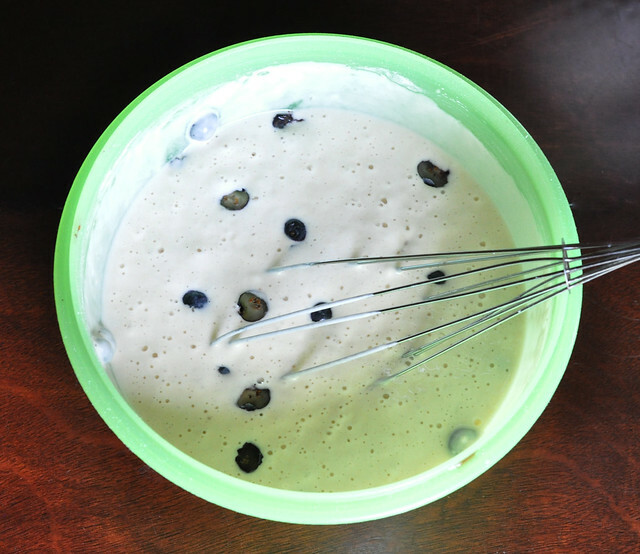 Once your mix is prepared, it's time to grease the griddle (I use olive oil) and decide if you want to make large pancakes, mini pancakes, or a combination of both! I always make mini pancakes, but I usually make a batch of large pancakes, too. 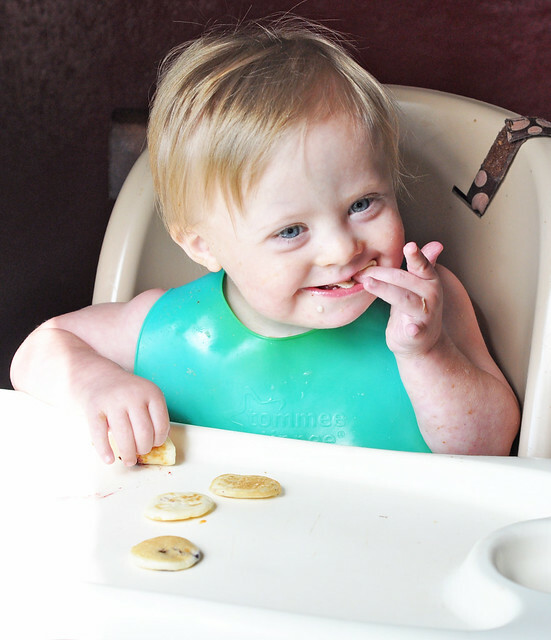 The mini pancakes are so easy for Lily to eat and Liam can just pick them up! 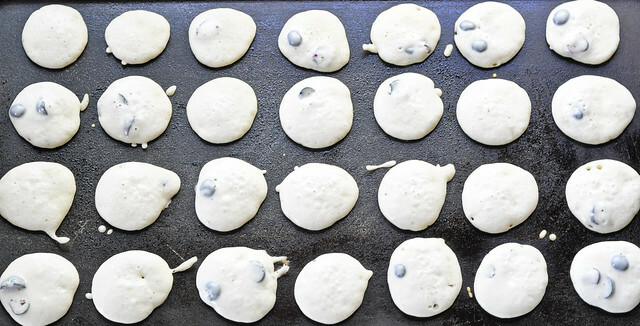 To make the mini pancakes, drop the mix onto the griddle using a 1/2 TBSP measuring spoon. It works perfectly, and makes a lot at once! And, obviously, bigger spoon=bigger pancakes! Give them a flip, allow them to cook on the other side, then stack them on a plate to cool! Repeat the process until all the mix is gone. 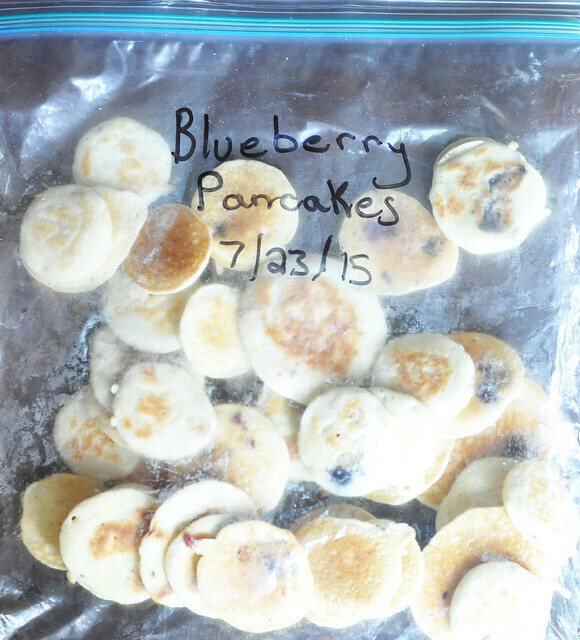 Once the pancakes cool down, put them in a freezer storage bag, label the bag, and add the date they were made. I always make two varieties of pancakes, so I just repeat the process with the next batch! It only takes about 15 minutes start to finish and the pancakes last the entire week! They're perfect for my entire family! They can be heated up in the microwave in just seconds. Grant doesn't have time for a meal before work, so he can heat one up and eat it in the car. (This also applies to me as I'm running out the door to take the kids somewhere!) Dylan and Lexie know how to microwave them, so they can prepare their own breakfast if necessary. 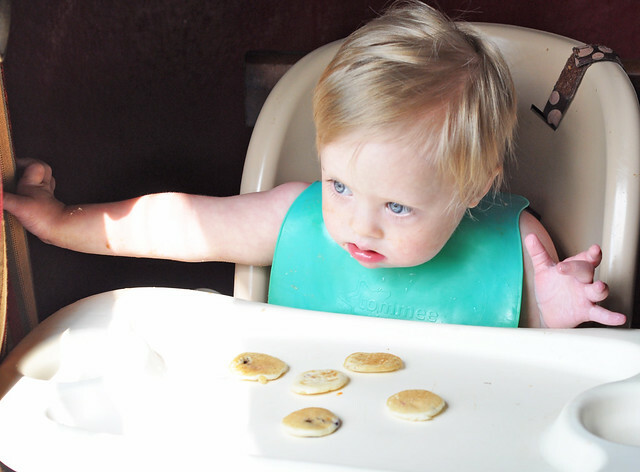 The mini pancakes are the perfect size for Lily and Liam, and I don't have to cut them up. This method is a win for everybody! It saves time, and, if you compare the cost to a box of store-bought pancakes, it saves money, too! Oh, and of course, on the days I make the pancakes, we have them for breakfast! And on those busy mornings when there isn't much time to eat? Quick AND easy! 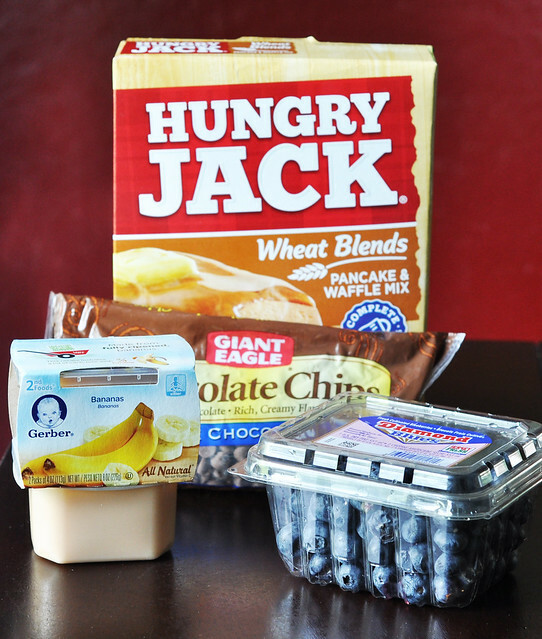 What are your favorite breakfast hacks to save time and money? I can't believe how quickly they devour them! What a great idea!!! Can not wait to do this! Thank you! It saves me so much time in the morning! And all I need is the waffle iron! Haha! YES! We make waffles or pancakes every Sunday and we always have extras, so I freeze them. Speaking of, this post made my tummy hungry, so now I have some to pull out and eat :) I LOVE them with a smashed banana...so good and naturally sweet, so no need for syrup! They are really good with banana. Definitely my favorite, but everyone else prefers blueberry! We don't use syrup on them. Just a tiny dab of butter! I LOVE this idea!!! I'm going to start doing this when school starts. It really saves a lot of time!!! I freeze our leftover waffles (the pancakes never seem to reheat that well, for some reason) but my daughter won't eat them. She says they get too crunchy! Isn't it funny sometimes what kids will and won't eat? 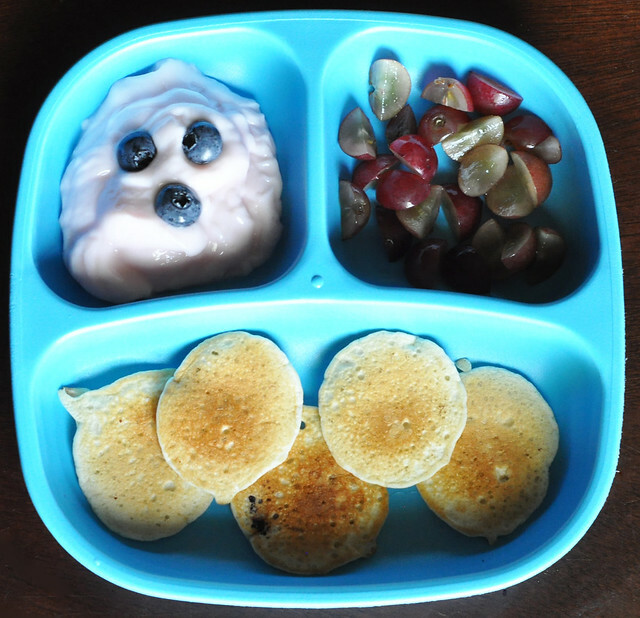 Great idea adding in pureed fruit to get around your daughter's fruit preference. Interesting! Lexie is really weird about textures and tastes, and definitely notices when things are different! Thankfully, she loves pancakes, even out of the freezer! Oooooh! This is great. My kids looove pancakes. I agree with Tracy up there ^^^^^^^ - I'll have to start doing this when school starts too. Can you say, Best Mom Ever?! Haha! Haha! Nope, just a mom who wants to save some time, but thank you! You should definitely try this out. It's my favorite time-saving secret! It's only the two of us at home, but after having pancakes on the weekends it never fails about Wednesday I wish I had one I could smear with almond butter, roll up and eat on the way to work. I will tell you that I have a batter dispenser and I love it! Same sized pancakes, no batter drips, and easy clean up, too. I can't remember where I got mine, but I know Crate & Barrel has one for less than $10 and you can even make your batter the night before and store in the fridge. Just throwing that out there as another time saver. I come from a family of four kids - three in 15 months no less [I was 15 mos. old when my mom had my twin brothers] - so I learned a lot of hacks from my mom. I completely forgot, but I think I have one, too! Thanks for the reminder!!! I keep pancakes and waffles in our freezer too! They do really well and are always a hit. My kids ask for them everyday!!! Totally worth it! What?! Babyfood?! That is crazy and awesome. I will have to try these out soon. Thanks for sharing your secret! Yep! I have to sneak those fruits in for Lexie!